Hello friends! How is your week going? As usual of late, my week is flying by! I forgot what it is like to be so busy at work and how it makes time just speed up. My old job was insanely busy…as in I would never ever call in sick (when I was really sick) and was always hesitant to take vacation because the aftermath was so awful, but my new job is just a normal busy usually so I forgot what it was like to be slammed with work! On Tuesday night I went to Dunlay’s on Clark with my friend Alex. I have been to Dunlay’s for both dinner and brunch and always love the food there. Tuesday’s are half priced bottles of wine, so it is the perfect time to go! 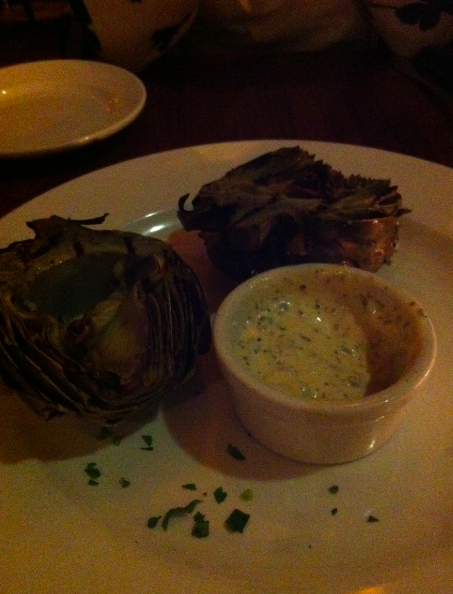 We split a bottle of Pinot Grigio and ordered one of my favorite things there—the artichoke appetizer. It is a grilled artichoke with an herb mayo for dipping. So so good. I usually order the vegetable plate but I was horrified to find they took it off the menu! 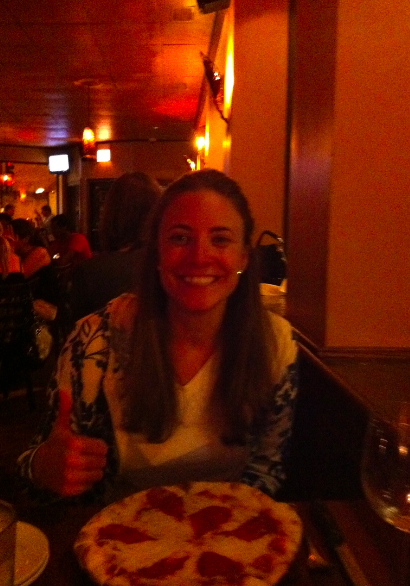 Instead, we ordered two flatbread pizzas and split them which was a great decision. 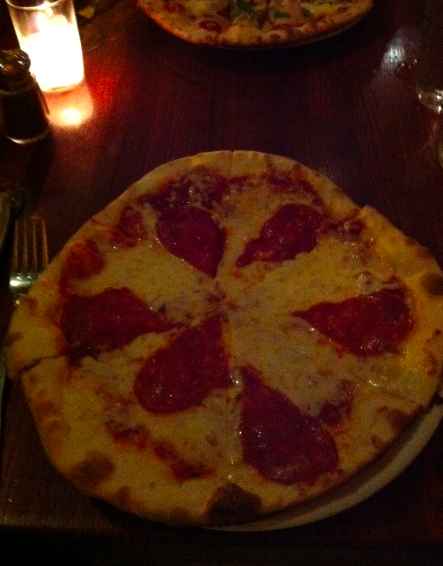 One was the ‘sopressata’—which was pretty standard—just marinara, cheese and (giant) pepperoni’s. 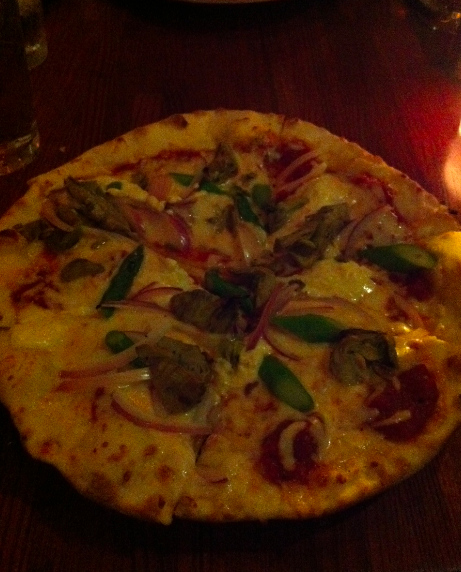 The other was the primavera which had tomato sauce, asparagus, red onion, artichoke and lemon ricotta cheese. I liked them both a lot—the sopressata was pretty spicy which I liked and the lemon ricotta on the primavera was what made it I think. Sorry for the less than stellar pictures, the lighting was really bad. This neighborhood restaurant is a great place to go for a weeknight dinner or a casual Sunday brunch. They have pretty standard fare, but everything from the burgers to the pizzas to entrees are really delicious! Everyone I have gone to brunch with loves their brunch too—I like it, I am just more of a lunch person and their brunch menu is pretty heavy breakfast, so I’m not as big of a fan of going for brunch. Yesterday I actually worked from home and had a half day because I had a dr’s appt at the Diamond Headache Clinic here in Chicago. I read that the initial appointment is usually around 3 hours long and entails changes to lifestyle and diet + medication if needed. So, I was actually really looking forward to the appointment because I was hoping maybe the doctor would see something I had missed in terms of making lifestyle changes to get rid of my headaches. Anyways, I got some bloodwork done, an EKG and have an MRI appt set up (all things I have done before, so I’m not holding out much hope with regards to these—more just to make sure I haven’t developed a tumor or something). I left with 2 new prescriptions and while I was initially very excited about the prospect of these things helping, when I went home to do some research, my excitement dwindled pretty quickly. One of the drugs he gave me seems fairly similar to the last drug I was on (which you can read my account about here) yet this one seems to have a pretty high prevalence of weight gain. He told me that due to my healthy diet and the high amount of exercise I do coupled with the low dosage, it shouldn’t be an issue for me at all. Plus, I have read that some people actually end up losing a ton of weight (not saying that I want that to happen either, but it would be better than gaining!). I know the weight thing sounds kind of vain. The problem is that as much as I am good about staying in a ‘healthy’ mindset, I can’t guarantee that I won’t become a calorie obsessed workout freak when I have the knowledge that a medication I’m taking is going to most likely cause me to gain weight. I know myself well enough to know that is a really slippery slope to put myself on. I just can’t help feeling pretty disappointed overall. It is so frustrating to have these headaches and really no way to get rid of them besides masking them with nasty medications. Medicines like these that have such strange and strong side effects really scare me because we really don’t have a good idea about what their long term effects are. Ideally, I want to get to the root cause of why I get them in the first place, but since doctors don’t really know/agree why migraines occur, I guess I feel kind of lost and hopeless as far as how to fix them. I do think migraines and stomach issues are closely tied, but it is kind of a crapshoot trying to figure out my exact triggers. Sorry to be a Debbie Downer, but that is kind of where I’m at. As bad as it sounds, I almost wish they would find something on the MRI or EKG, not because I want to have something wrong with me (at all), but only because it would be a concrete reason and a way to get rid of these things. I keep going back and forth as to if I should try the medication. I think I will give it a shot for a week and see how it goes. If I start to have too many side effects, I’m not going to stay on it. I also need to start it on the weekend as a lot of people said they had issues driving afterwards and almost 50% report nausea and I don’t really want to be puking at work–or at all–for that matter. The only good news is the other medication he gave me is in a ‘shot’ form instead of a pill form (which I have now) so I can use it even if I feel nauseous. A bit scary (it is a needleless shot and he said using it is LOUD like a popping champagne cork) but instead of taking a long time to start working, it is effective immediately so that part is great. What would you guys do if you were me? Would you take the medicine? It would be a pretty big relief to have no headaches, but I’m just not sure if the tradeoff is worth it. Alright, done obsessing over that…just wanted to update you guys on where I am at . Also, I really would recommend the Diamond Headache Clinic for people who get headaches…I know I sounded kind of downer towards the clinic too, but as far as MD’s/neurology go, I do think the doctor I saw was the most knowledgeable of anyone I have ever been to. Hoping to do some blog fix-up’s and updates tonight…a couple of (minor) but cool new things coming soon! Also for the most touching story ever, read here. Forewarning–it is a tear jerker and had me crying at my desk today. that does not sound fun that you’re not getting the answers you want! i agree with kmac and with what you posted. try the meds out and see how you’re feeling… 1 week won’t hurt.